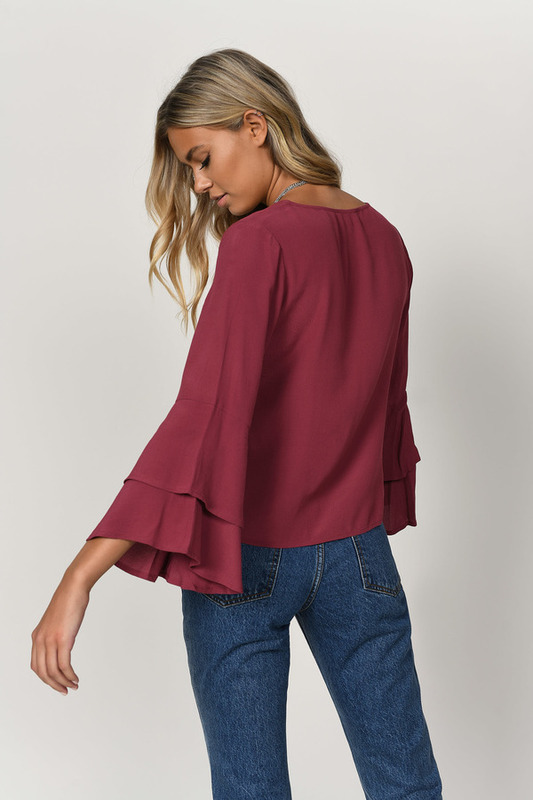 Check out Tobi's Silent Traveler Ruffle Sleeve Blouse Go with the flow with the Silent Traveler Ruffle Sleeve Wine Blouse. This ruffle sleeve blouse features a deep v neckline, tiered ruffle sleeves, and a finishing front tie. 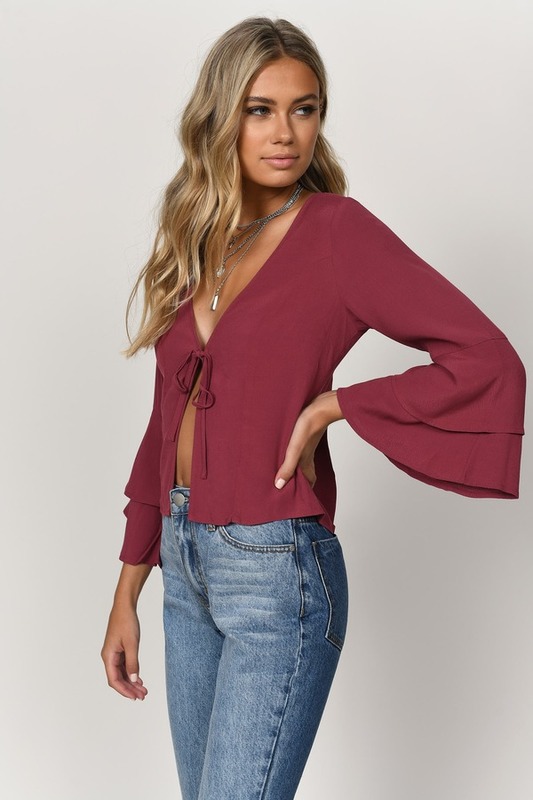 Perfect as a festival top or brunch top, pair this versatile blouse with high waisted denim shorts, jeans, or culottes! Go with the flow with the Silent Traveler Ruffle Sleeve Wine Blouse. This ruffle sleeve blouse features a deep v neckline, tiered ruffle sleeves, and a finishing front tie. Perfect as a festival top or brunch top, pair this versatile blouse with high waisted denim shorts, jeans, or culottes! Go with the flow with the Silent Traveler Ruffle Sleeve Cream Blouse. This ruffle sleeve blouse features a deep v neckline, tiered ruffle sleeves, and a finishing front tie. 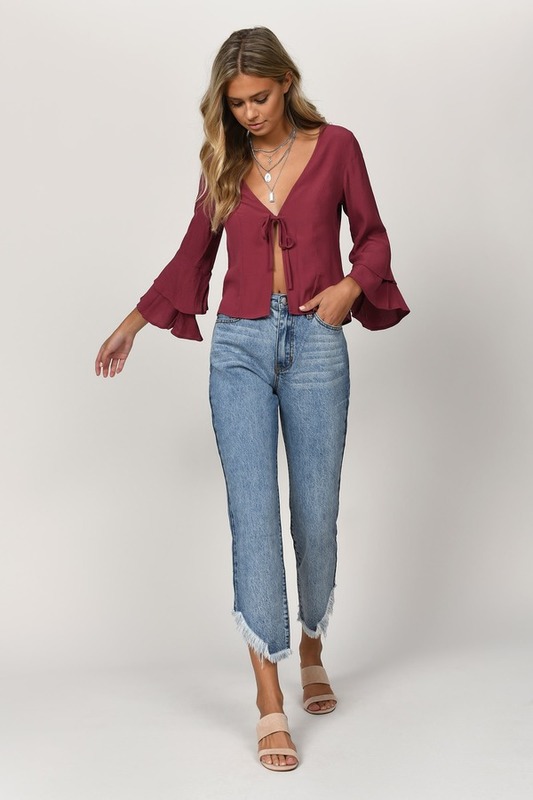 Perfect as a festival top or brunch top, pair this versatile blouse with high waisted denim shorts, jeans, or culottes! Wine, Cream modeled on a size Small.